"I'm ready… I've got Bob. He'll look after me…" Cleopatra Films has debuted a new official US trailer for Roger Spottiswoode's inspirational film A Street Cat Named Bob, based on the bestselling book about a street musician whose life is changed by an adorable stray cat named Bob. Luke Treadway plays James Bowen, a young homeless busker and recovering drug addict living on the streets of London. The cast also features Bob the Cat (the real one! ), Ruta Gedmintas, Joanne Froggatt, Anthony Head, and it was filmed mostly on location around Covent Garden. This looks quite charming and it should definitely find an audience in today's cat-photo-obsessed world. This seems more uplifting and hopeful than most indie films. You can still watch the first official UK trailer for A Street Cat Named Bob here, to see more from this. Based on the international best selling book by James Bowen. The true feel good story of how James Bowen, a busker and recovering drug addict, had his life transformed when he met a stray ginger cat. 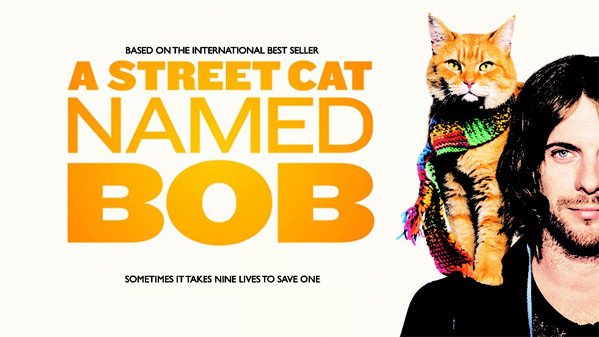 A Street Cat Named Bob is directed by veteran Canadian filmmaker Roger Spottiswoode, of many films previously including Turner & Hooch, Air America, Under Fire, Tomorrow Never Dies, The 6th Day, and The Journey Home most recently. The script is by Tim John and Maria Nation, adapting James Brown's book of the same name. Sony Pictures UK will release the film in the UK starting this November. Cleopatra Films will then release A Street Cat Named Bob in US theaters starting November 18th this fall. Anyone? Aww...they gave us another short film. Seriously though, this was the entire film in summation, including the redemption scene with his father. Can't wait. How do we find out ahead of time, where the film will be shown in the US? I hear that it's going to be a limited release and I may have to travel to see it.